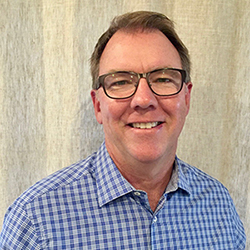 As President & CEO of bBIG Communications, Dave brings 29 years of entrepreneurial business experience in support of a growing team of self-motivated people who are committed to the success of their clients. His business passion is directly tied to helping partner companies achieve sales success via Geo-Behavioral Marketing and Best Practices Reporting. Originally from Michigan, Dave grew up in six different states and quickly became accustomed to adapting to new communities and schools. Embracing the notion that change is an integral part of growth, Dave supports the belief that the world doesn’t stand still, “we’re either getting better or worse every day.” His commitment to growing an authentic company is rooted in bBIG’s mission to develop rich customer experiences. Along with his wife, Sheri, and their three daughters, Dave resides in Southern California. He is a proud supporter of the local sports community and – as a “Cheer Dad” – fully endorses the sport of Cheerleading. Dave sits on the board of the YMCA of San Diego County – Overnight Camps and appreciates the opportunity to travel, listen to sappy 70s music and do all things outdoors. 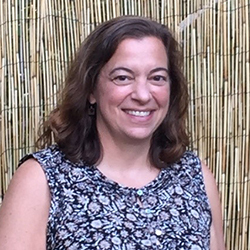 As one of three managing officers at bBIG Communications, Sheri oversees the Accounting and Human Resource Departments. Contrary to public opinion, Sheri is convinced there is a way to make Accounts Receivables and Payables fun! Her involvement with the company has spanned 24 years and her responsibilities have evolved over time. Sheri made the move from California to New York City to join the company in 1994 as the Manager of Office Systems and Production. With a specialized background in design and an interest in the creative process, she pursued outside training on the Adobe Creative platforms and brought production in-house for the company. Under the original name of Market Tactics, Inc., the support services side of the business evolved and segued into the digital space in 2011. Upon her return to California, she played a key role in the strategic development of the MyMilitarySavings.com Platform and bBIG Communications, Inc. Sheri has recently lead the development of an internal workflow database that integrates accounting and sales, capturing key efficiencies for the company’s internal team and for our clients. Her interest in streamlining workflow and her experience in client, staff, and supplier relational processes have kept her excited and engaged in the evolution of bBIG Communications. Outside of work, Sheri enjoys travel, great movies and hanging out with her three daughters and some guy named “Dave.” She currently resides in Southern California. Mark is the Chief Operating Officer of bBIG Communications. 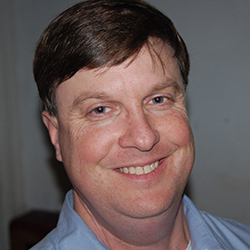 With more than 25 years of marketing and advertising experience, Mark is well-versed in identifying and understanding consumer behaviors and shopper marketing trends. In his current role, Mark manages the effective execution of brand identity, drives strategy and creative development, and oversees all aspects of print production, digital media, and social media across multiple channels. Like other bBIG team members, Mark wears a variety of hats – from sales to marketing management to hockey color commentary. Mark is a native of Hingham, Mass., where he played, coached and presided over various youth sports groups. When he is away from the office, Mark umpires Varsity and Legion baseball across the South Shore and the Cape. His favorite hobby is chasing a little white ball around a golf course. Christine is the Sales and Customer Marketing Manager for bBIG Communications. She believes her 15+ year tenure in the military resale space is a testament to her ability to provide best-in-class marketing programs that help her clients grow brand share and revenue in commissaries worldwide. 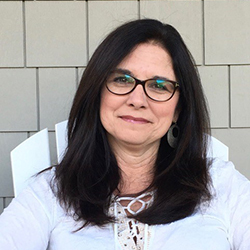 Prior to joining bBIG, Christine spent 30+ years working in varied sales and marketing roles in the consumer packaged goods industry. In her current role as Sales and Customer Marketing Manager, manages a $6M promotional budget and is responsible for creating and implementing annual promotional business plans for military brand managers. She also oversees the company’s business- and relationship-building initiatives. Christine values her strong organizational, analytical, problem resolution and follow-up skills. Laura is the Executive Vice President of Sales, where she oversees general retail and e-commerce. She is a passionate brand advocate, with extensive experience driving consumer engagement across marketing platforms through personalized strategy. With 15+ years in the consumer-packaged goods industry, serving on both the manufacturer and the marketing services side, she brings a balanced perspective in formulating the “Win-Win” for brands and their consumers. The disruptive and continually changing dynamic of consumer shopping behavior, retail landscape, and the tools marketers have available to engage them, is a perpetual challenge that brings out her personal excitement, creativity, and enthusiastic problem-solving skills. Laura is a California native, with a B.S. in Marketing from Miami University, Ohio. Upon graduation, she promptly scurried back to the sun and hasn’t left since. As a mother, wife, pet-lover, gourmet cook, and DIYer, she thrives on a busy, organized chaos-type life. Marlo joined bBIG Communications in July 2016 as an Account Director. She is an enthusiastic marketing professional with 20+ years of integrated marketing experience. Marlo comes from a diverse professional background, working for several years in account-specific shopper marketing for consumer packaged goods clients. Throughout her career, she has gained a deep understanding of the path to purchase, which she utilizes in her current role to drive client sales. As a natural-born leader, Marlo excels in fast-paced environments and thrives while balancing multiple complex projects at once. She values quality and efficiency in her work, and enjoys the relationships she has built with her clients, as well as her coworkers. It’s a true team atmosphere! In her spare time, Marlo enjoys spending time with her family and friends, especially her two daughters and husband. She has been active with the local Junior Woman’s Club, where she enjoys volunteering for local non-profit organizations. Every winter you’ll find her skiing in the Rockies, a life-long passion she continues to enjoy! 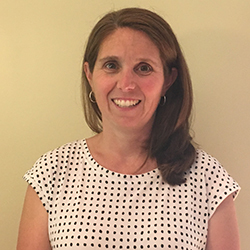 As the Manager of Sales & Marketing Analytics for bBIG Communications, Mary seeks to increase organizational efficiency within the company by managing the AR and providing analytics to the sales teams. Before joining bBIG, she spent several years working in the international luxury watch industry and – more recently – spent over a decade in the consumer goods industry, where she achieved professional success working for a prominent Fortune 100 company. These experiences have prepared her to provide the best-in-class service for which bBIG Communications is known. In her spare time, Mary goes about life with her Golden Retriever, Maisy, by her side. 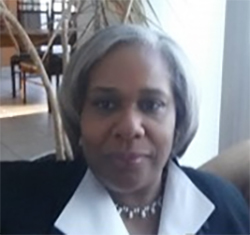 She also enjoys maintaining a ‘neighborhood’ veggie and flower garden, serving on the board of the New York Chapter of the American Logistics Association and traveling. As a Production Manager for bBIG, Colleen wears a variety of hats. In this role, she is primarily responsible for driving growth through the creation and execution of strategic marketing strategies. 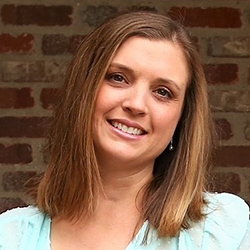 Colleen comes to bBIG Communications with 15+ years of experience in the marketing industry. During her career, she has worked with both agencies and in-house marketing groups. She is a committed leader with a very hands-on style of management. 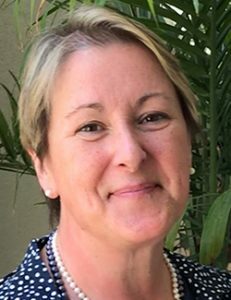 She specializes in managing large, multi-channel campaigns and establishing cross-functional, streamlined processes aimed at enhancing organizational efficiency. In her spare time, Colleen likes to spend her time at the beach with her husband, three children and pet dog. She finds that her background in project management is very helpful when it comes to managing her kids’ hectic schedules! Gina has been with bBIG Communications and its divisions since 2011. As Senior Brand Production Manager, she is involved in multiple areas of web development and maintenance projects. 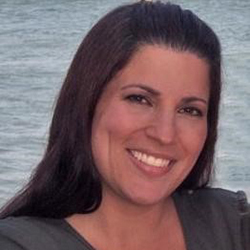 Gina joined bBIG with 15+ years of experience in the tech industry. In her current role, her responsibilities include designing and creating email campaigns, providing technical support for end users and team members, and supporting several WordPress sites. Gina is a troubleshooter, problem solver, and implementer for a variety of the company’s projects. Her favorite activities outside of work include cycling, kayaking and 4-wheeling on Cape Cod beaches. She also enjoys spending time with her black lab pup. Matt is a Graphic Designer and Brand Manager for bBIG Communications. 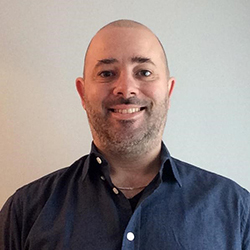 He has 12+ years of experience as a designer, working both in print and on the web. Matt considers himself a “jack of all trades” in his role with bBIG, as he is called upon for a variety of tasks and projects. He takes pride in his ability to find the most efficient method to accomplish various tasks and he enjoys sharing those methods with others. When not at work, Matt is an avid cook and loves to travel. Lisa has been part of the bBIG Communications team since 2011. 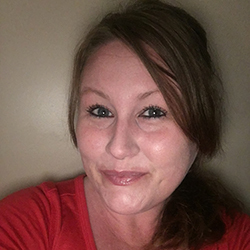 Working primarily as Graphic Designer and Brand Manager, she serves as creative for many featured graphics, coupon promotions and email campaigns. When not tackling work projects Lisa enjoys listening to music, beadwork and being a softball mom. She lives and roasts in California’s Central Valley with her husband, her 10 year-old daughter, and her fur-child slash officemate. Michelle is bBIG Communication’s passionate social media manager and loves to help brands achieve their sales and marketing goals. She is also in charge of the bBIG social media influencer program and enjoys working with social media influencers throughout the country to help build brand awareness. 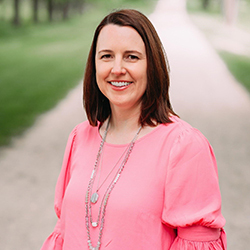 When she’s not hard at work on Facebook or Pinterest, she’s a mom of three little ones and lives outside of Minneapolis, where she enjoys a good thunderstorm and working on her food photography skills. 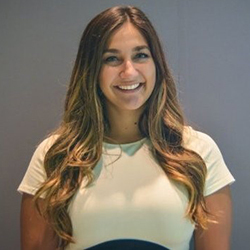 As an Account Coordinator for bBIG Communications, Amanda assists in the development, execution, and analysis of custom marketing programs for various clients. In this role, she is primarily responsible for tracking, analyzing and compiling campaign results for internal and external marketing initiatives. She also works closely with the My Hockey Live division of bBIG, where she oversees all aspects of MHL’s digital marketing strategy, while helping to coordinate the sponsorship and production of multiple high school and college club hockey games and events. After graduating from the University of Michigan in 2015, Amanda spent two years working in South Florida before moving to her current home in Worcester, MA. In her free time she enjoys trying new restaurants and traveling to different countries. She hopes to achieve “30 before 30” – visiting 30 countries by the time she turns 30 years old!